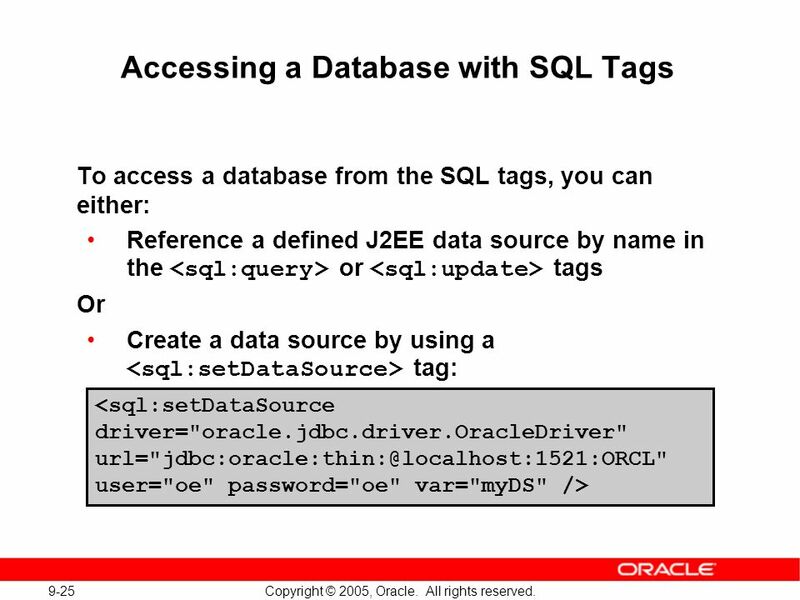 9 Copyright © 2005, Oracle. All rights reserved. 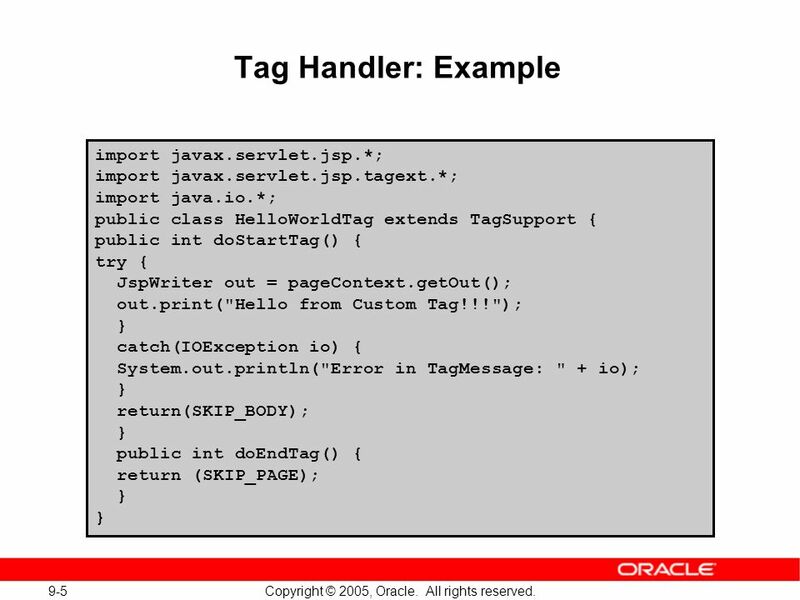 Modularizing JavaServer Pages Development with Tags. 3 9-3 Copyright © 2005, Oracle. All rights reserved. 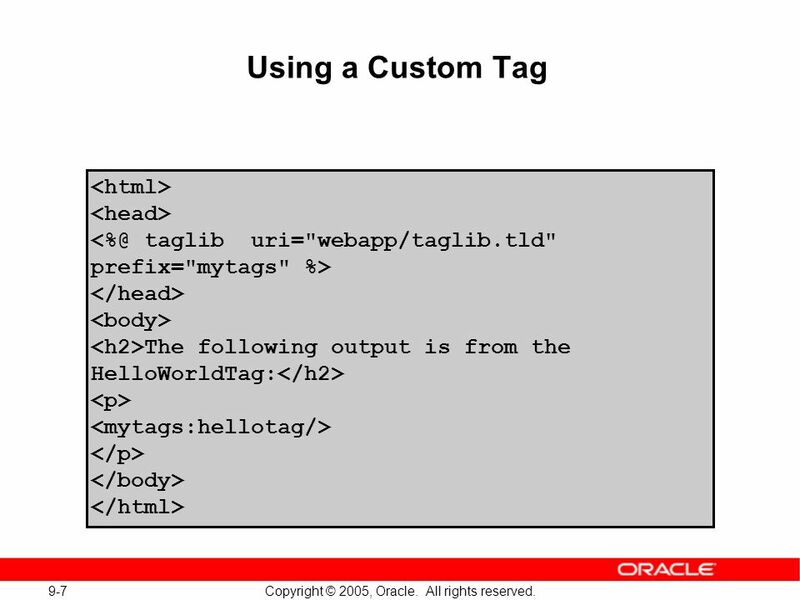 Custom Tags Custom tags are developed in Java and defined and used with XML syntax. 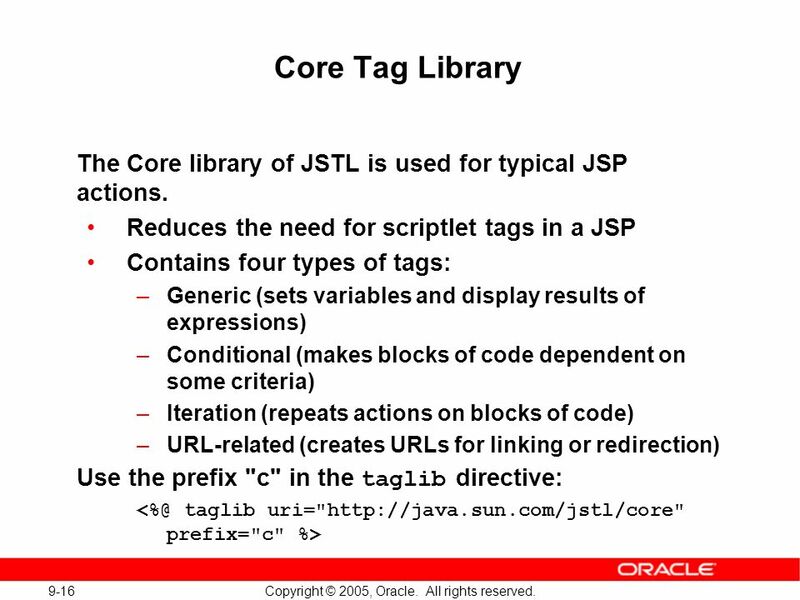 Tags are used in a JSP to reduce or constrain the amount of Java scriptlets in the page. 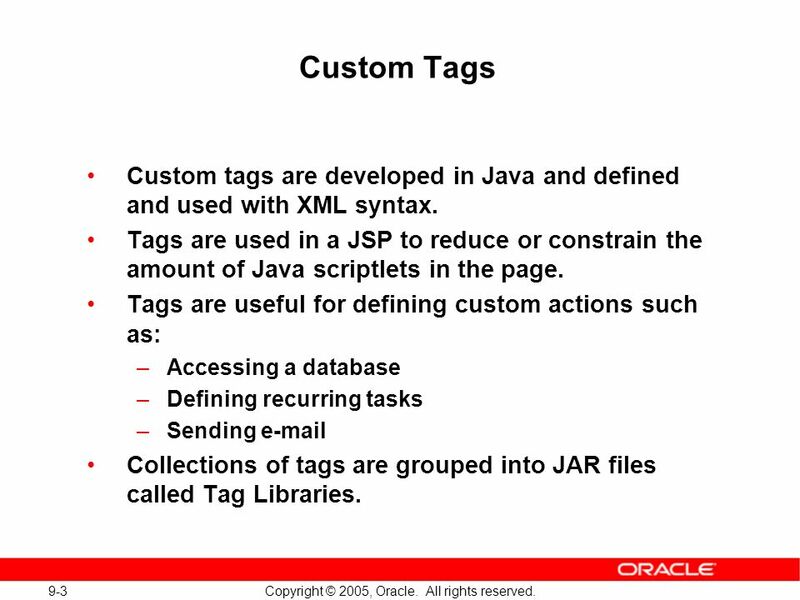 Tags are useful for defining custom actions such as: –Accessing a database –Defining recurring tasks –Sending e-mail Collections of tags are grouped into JAR files called Tag Libraries. 4 9-4 Copyright © 2005, Oracle. All rights reserved. 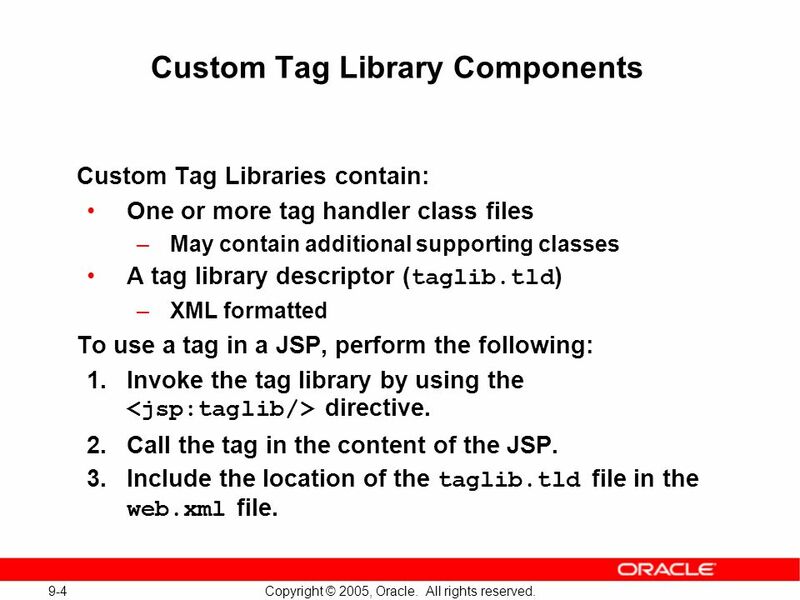 Custom Tag Library Components Custom Tag Libraries contain: One or more tag handler class files –May contain additional supporting classes A tag library descriptor ( taglib.tld ) –XML formatted To use a tag in a JSP, perform the following: 1.Invoke the tag library by using the directive. 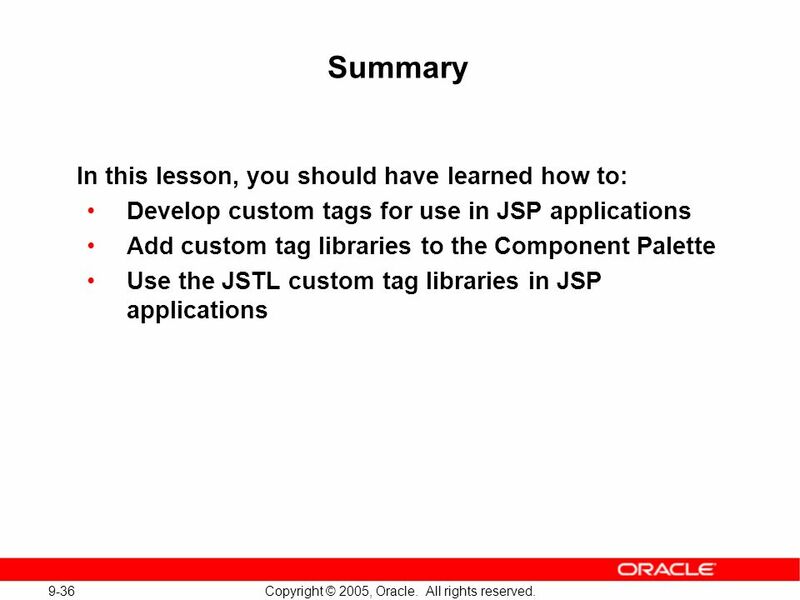 2.Call the tag in the content of the JSP. 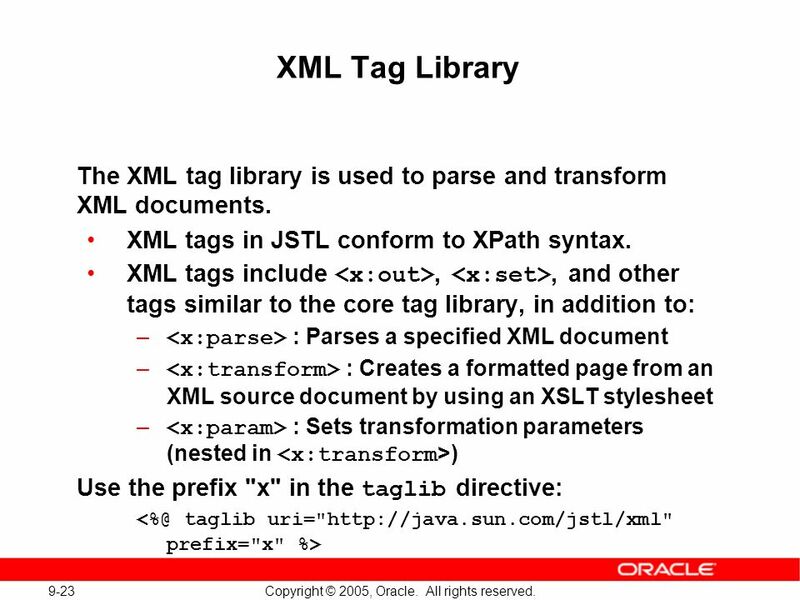 3.Include the location of the taglib.tld file in the web.xml file. 9 9-9 Copyright © 2005, Oracle. All rights reserved. 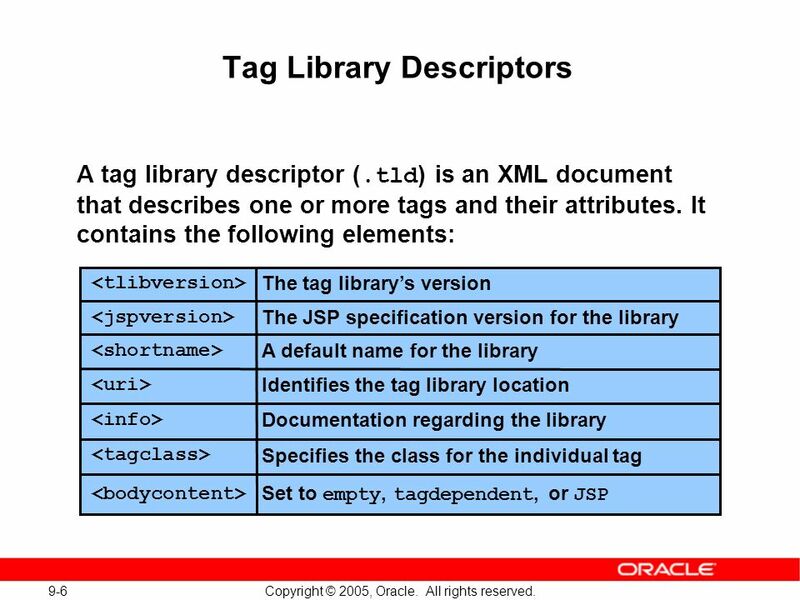 Creating a Custom Tag in JDeveloper To create a custom tag and a tag library in JDeveloper, perform the following: 1.Create a tag library descriptor from the JavaServer Pages category. 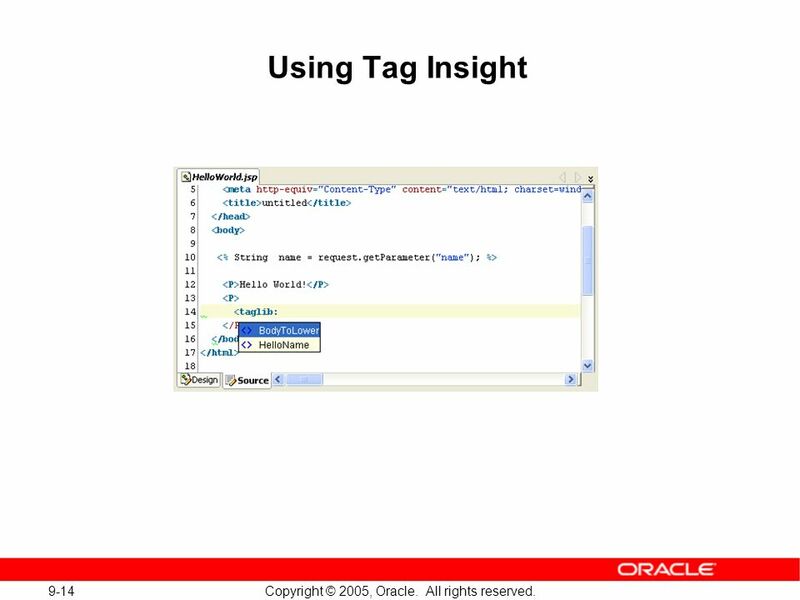 2.Right-click the.tld file in System Navigator and select Add Tag to create a tag handler. 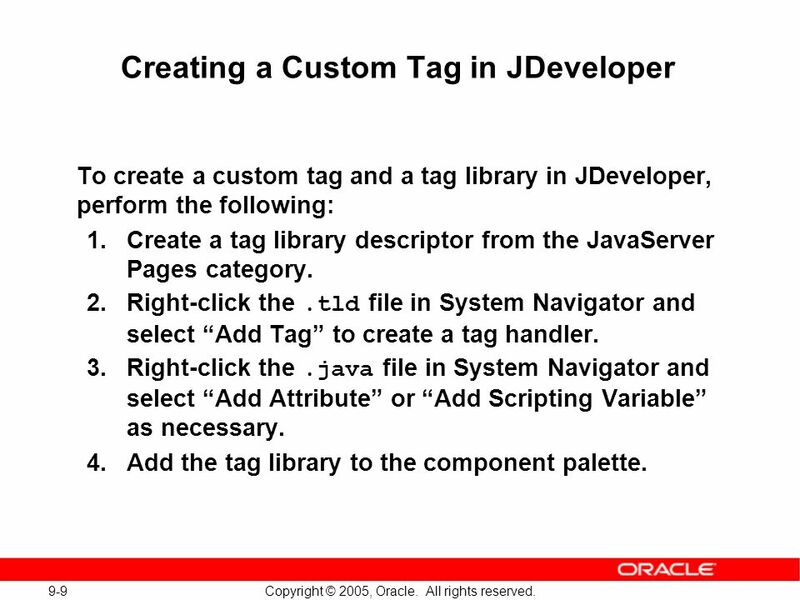 3.Right-click the.java file in System Navigator and select Add Attribute or Add Scripting Variable as necessary. 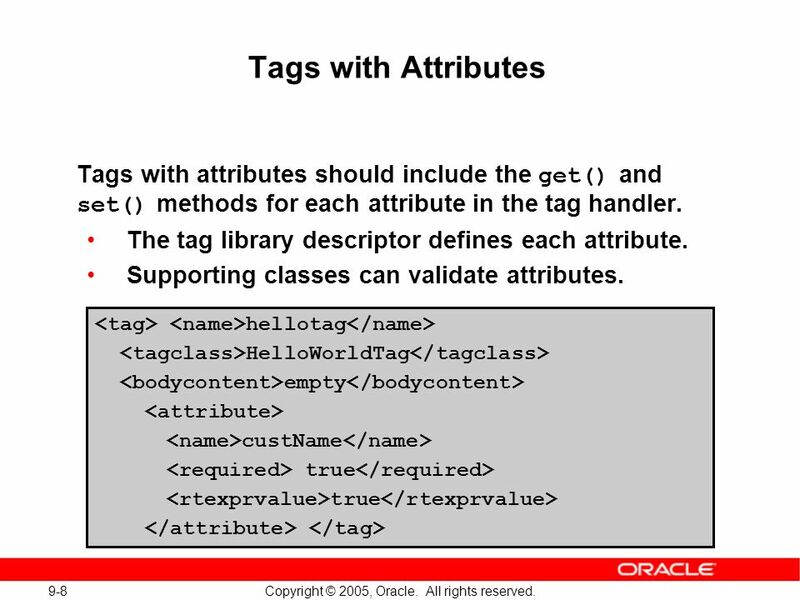 4.Add the tag library to the component palette. 10 9-10 Copyright © 2005, Oracle. All rights reserved. 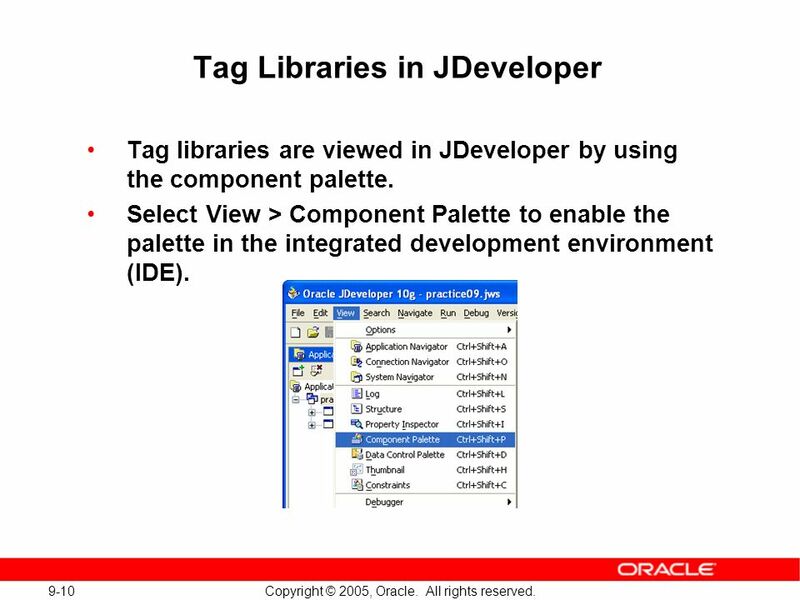 Tag Libraries in JDeveloper Tag libraries are viewed in JDeveloper by using the component palette. Select View > Component Palette to enable the palette in the integrated development environment (IDE). 11 9-11 Copyright © 2005, Oracle. All rights reserved. 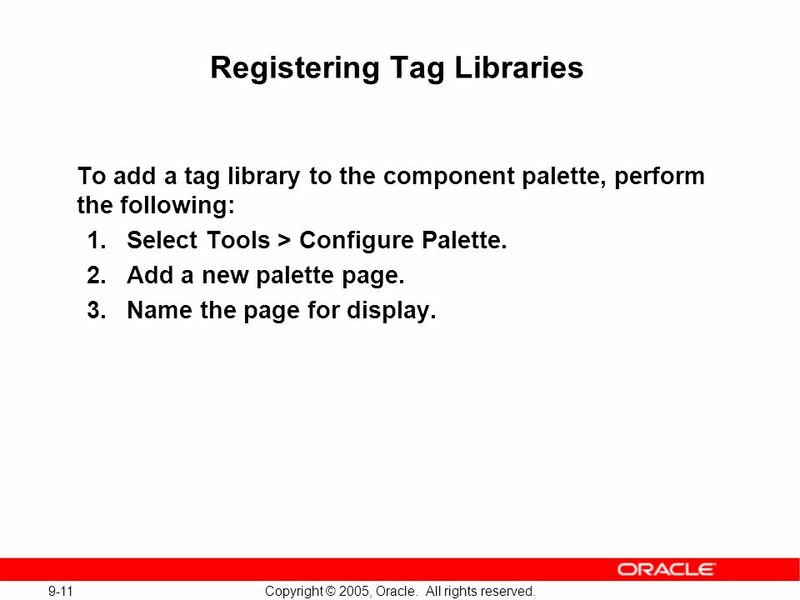 Registering Tag Libraries To add a tag library to the component palette, perform the following: 1.Select Tools > Configure Palette. 2.Add a new palette page. 3.Name the page for display. 12 9-12 Copyright © 2005, Oracle. All rights reserved. 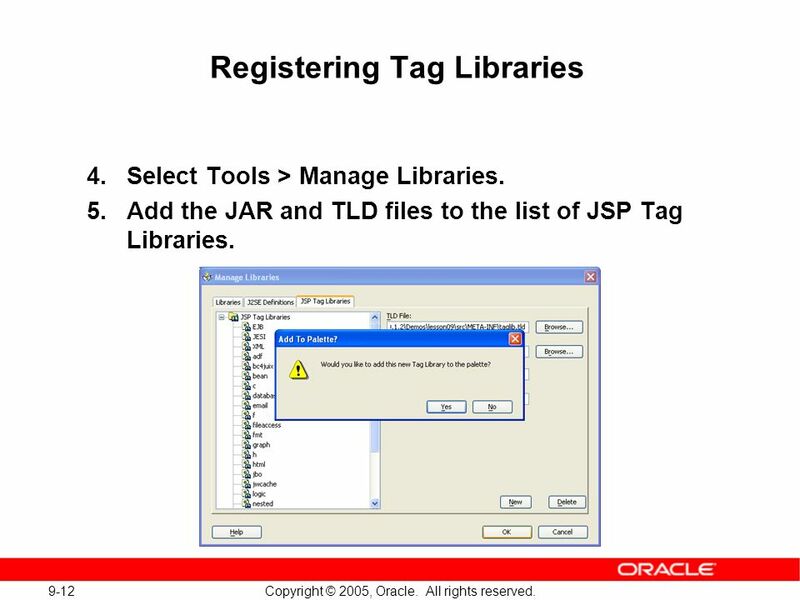 Registering Tag Libraries 4.Select Tools > Manage Libraries. 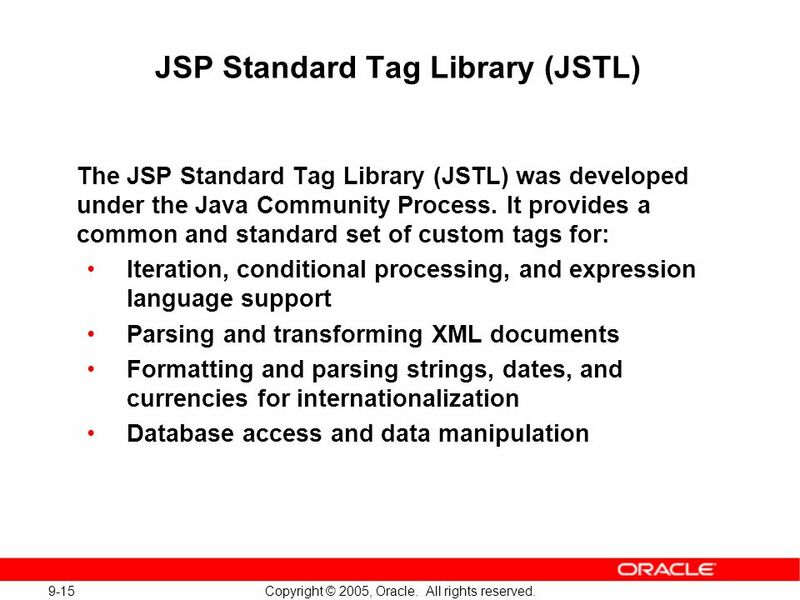 5.Add the JAR and TLD files to the list of JSP Tag Libraries. 17 9-17 Copyright © 2005, Oracle. All rights reserved. 22 9-22 Copyright © 2005, Oracle. All rights reserved. 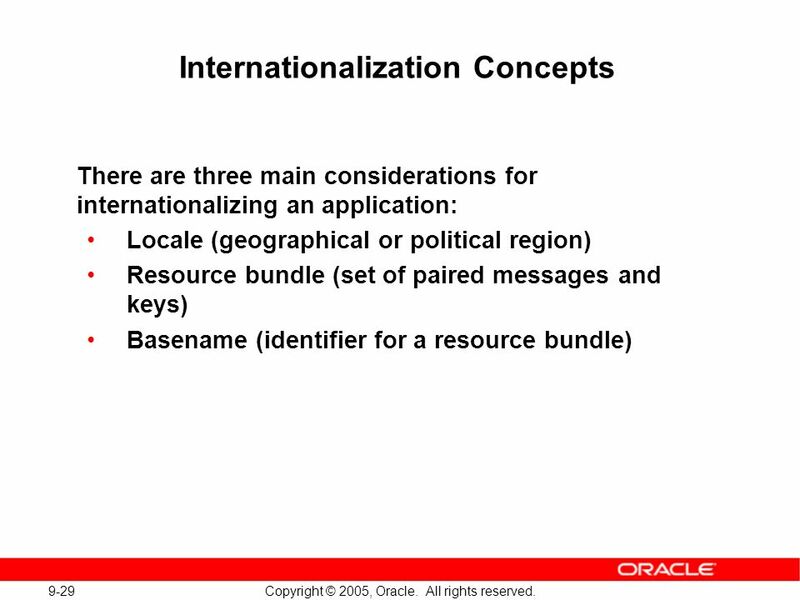 27 9-27 Copyright © 2005, Oracle. All rights reserved. 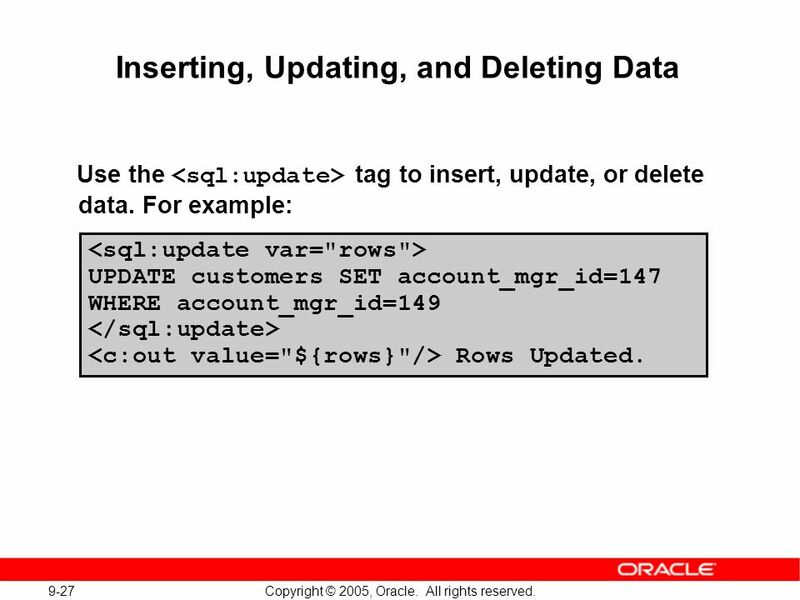 Inserting, Updating, and Deleting Data Use the tag to insert, update, or delete data. For example: UPDATE customers SET account_mgr_id=147 WHERE account_mgr_id=149 Rows Updated. 32 9-32 Copyright © 2005, Oracle. All rights reserved. 33 9-33 Copyright © 2005, Oracle. All rights reserved. 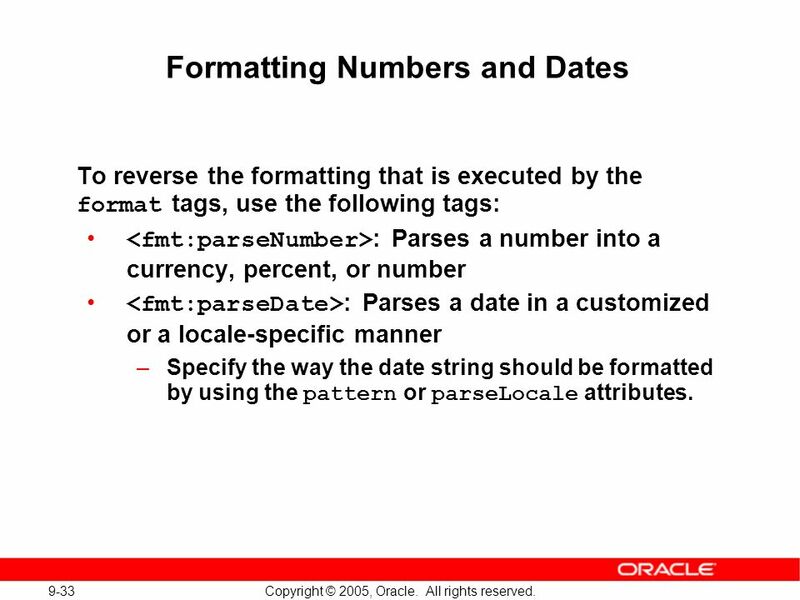 Formatting Numbers and Dates To reverse the formatting that is executed by the format tags, use the following tags: : Parses a number into a currency, percent, or number : Parses a date in a customized or a locale-specific manner –Specify the way the date string should be formatted by using the pattern or parseLocale attributes. 35 9-35 Copyright © 2005, Oracle. All rights reserved. 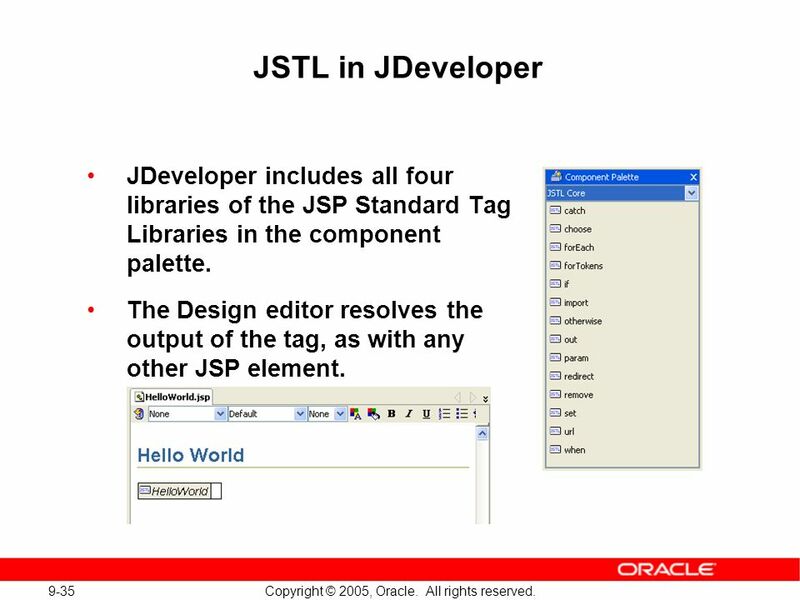 JSTL in JDeveloper JDeveloper includes all four libraries of the JSP Standard Tag Libraries in the component palette. 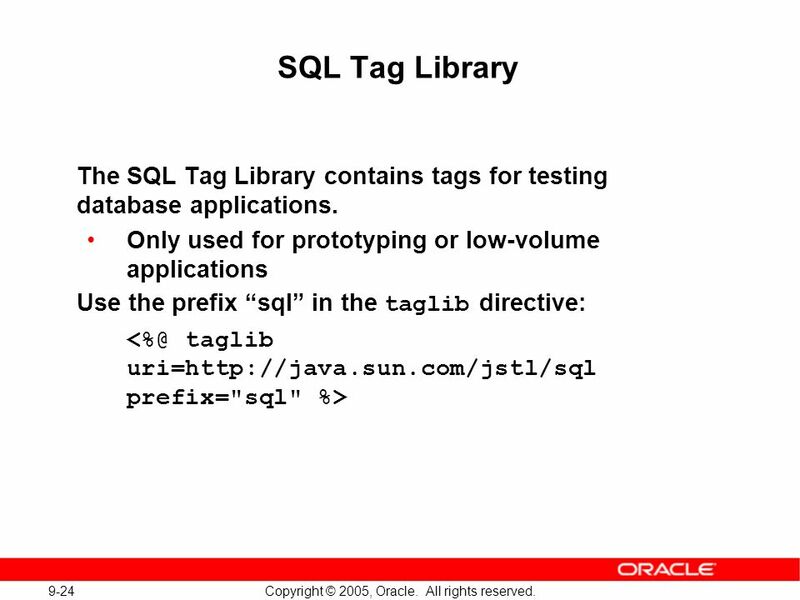 The Design editor resolves the output of the tag, as with any other JSP element. 37 9-37 Copyright © 2005, Oracle. All rights reserved. 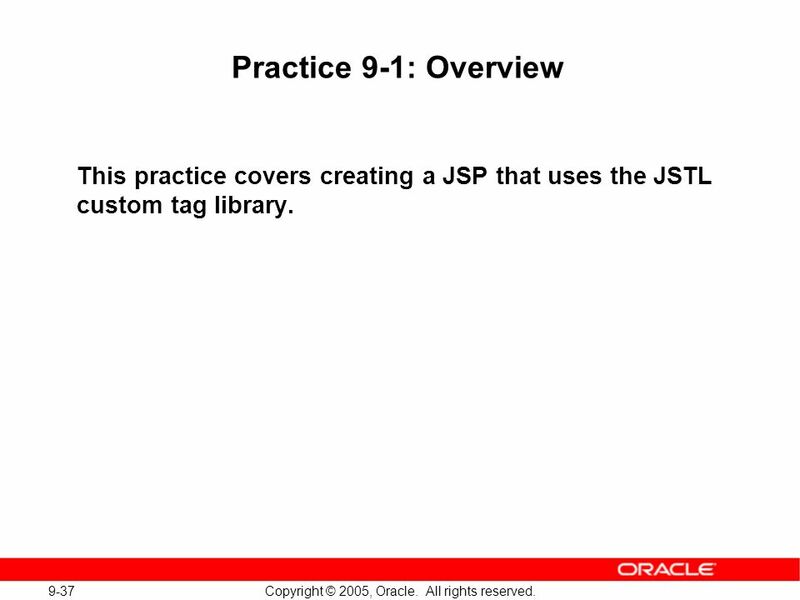 Practice 9-1: Overview This practice covers creating a JSP that uses the JSTL custom tag library. 38 9-38 Copyright © 2005, Oracle. All rights reserved. 39 9-39 Copyright © 2005, Oracle. All rights reserved. 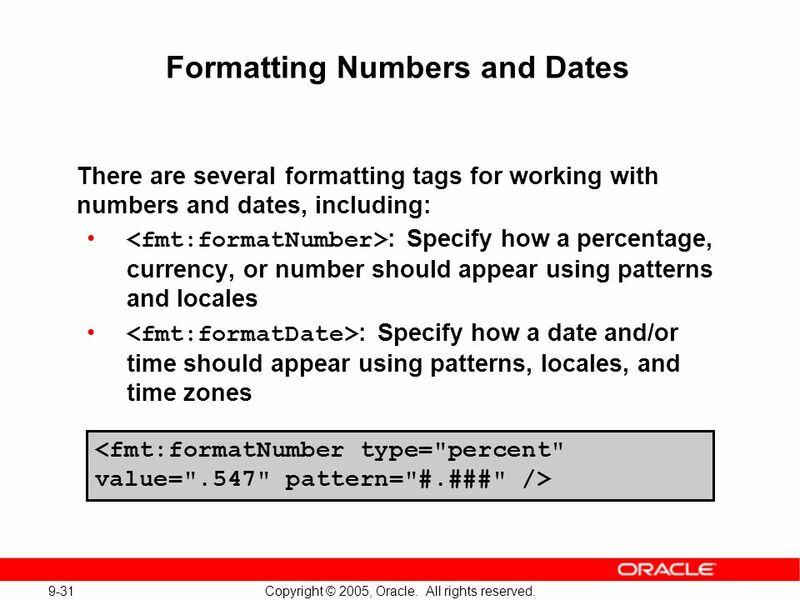 40 9-40 Copyright © 2005, Oracle. All rights reserved. 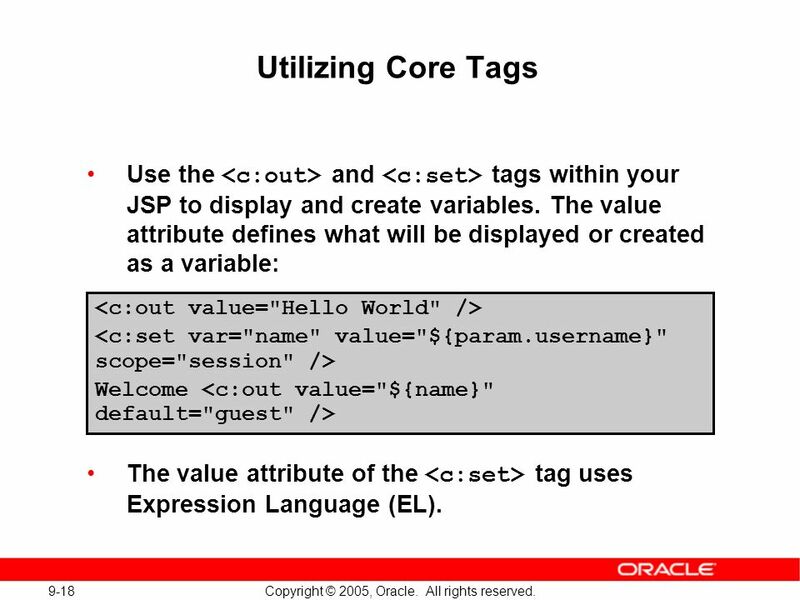 Download ppt "9 Copyright © 2005, Oracle. All rights reserved. 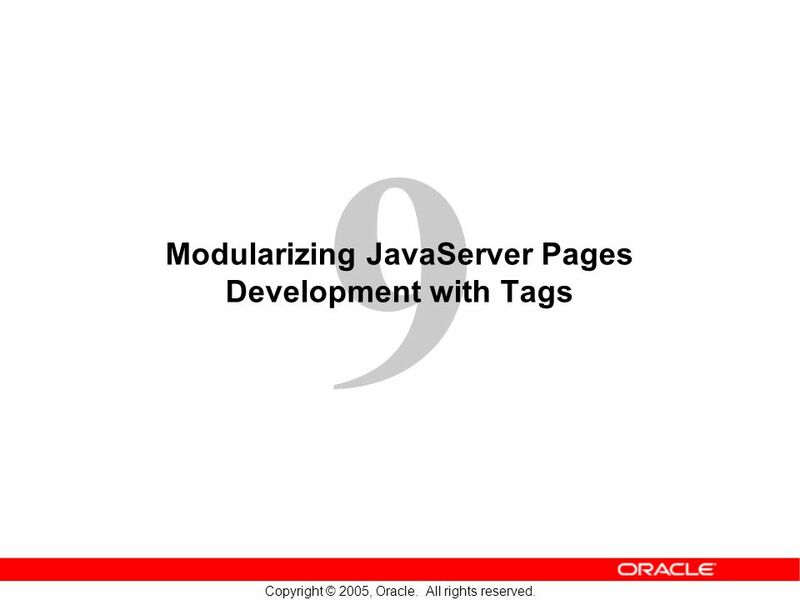 Modularizing JavaServer Pages Development with Tags." Chapter 7 Constructors and Other Tools. Copyright © 2006 Pearson Addison-Wesley. All rights reserved. 7-2 Learning Objectives Constructors Definitions. Copyright © 2003 Pearson Education, Inc. Slide 7-1 Created by Cheryl M. Hughes The Web Wizards Guide to XML by Cheryl M. Hughes. 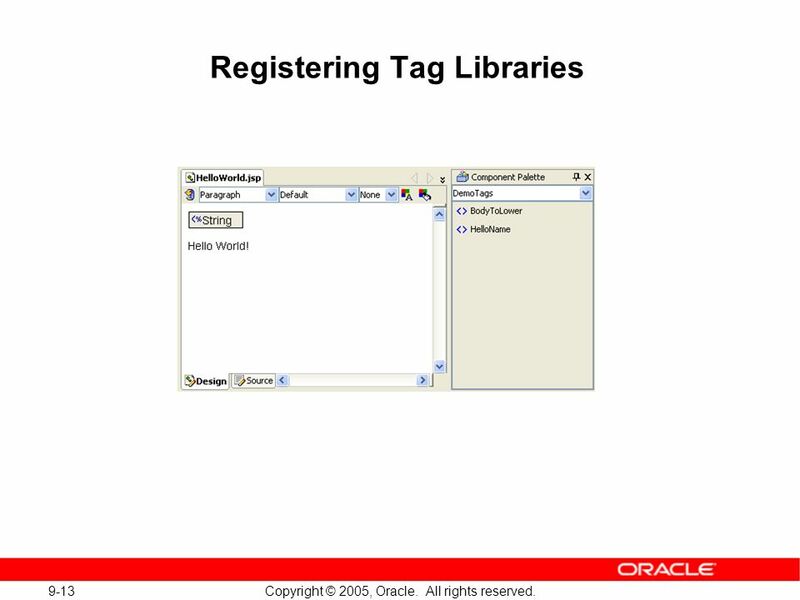 19 Copyright © 2005, Oracle. All rights reserved. Distributing Modular Applications: Developing Web Services. 21 Copyright © 2005, Oracle. All rights reserved. 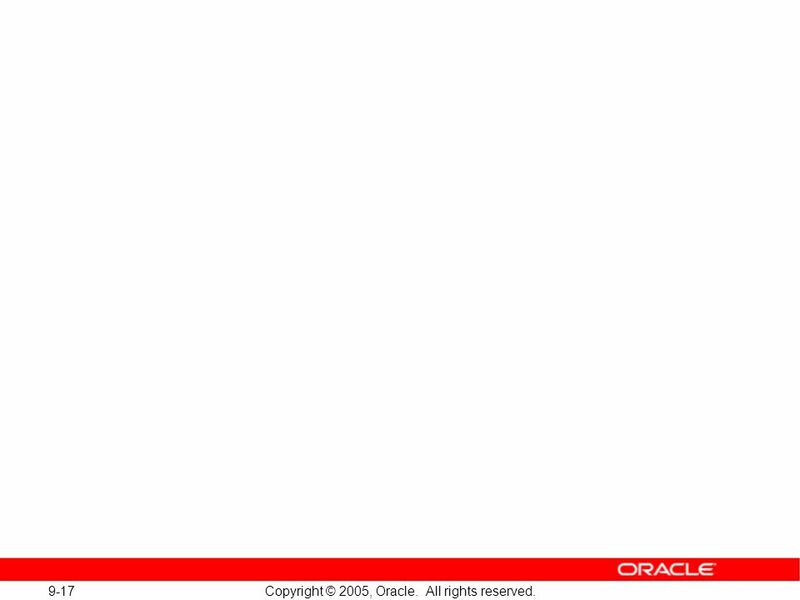 Oracle Application Server 10g Transaction Support. 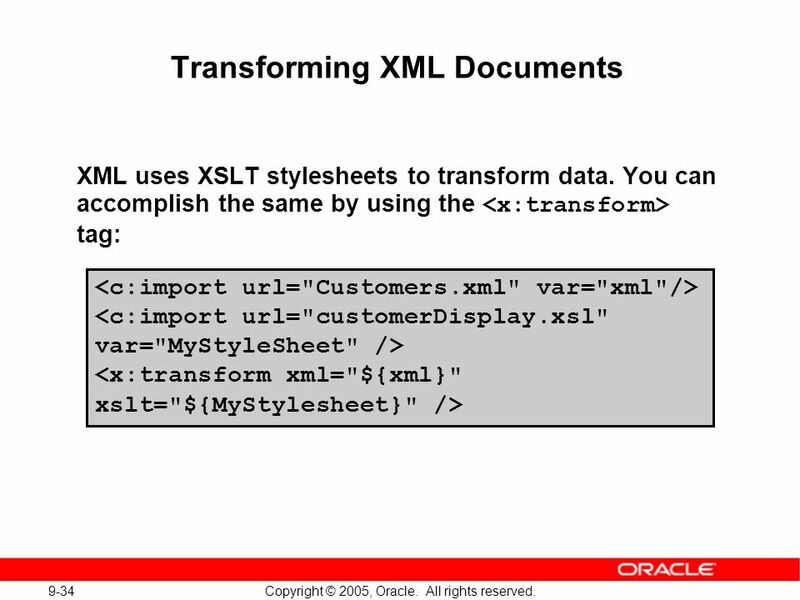 1 Copyright © 2005, Oracle. All rights reserved. Introduction. 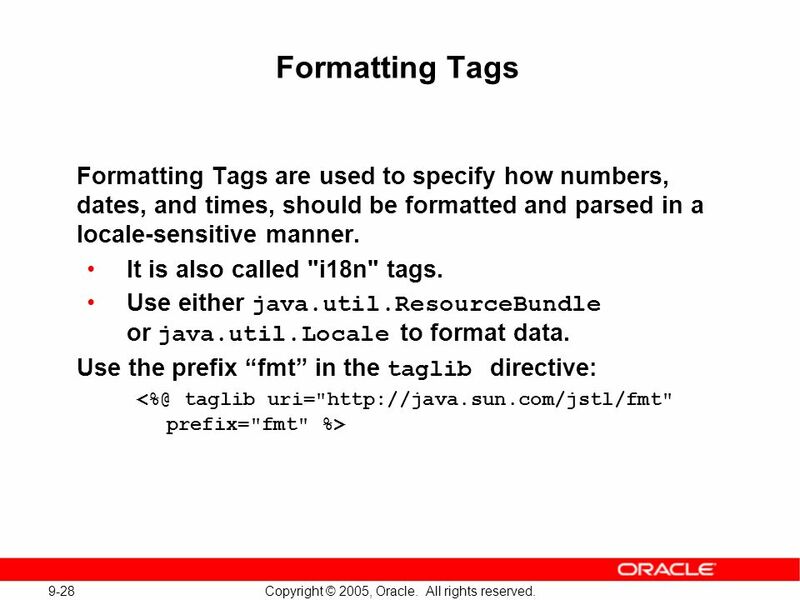 18 Copyright © 2005, Oracle. All rights reserved. Distributing Modular Applications: Introduction to Web Services. 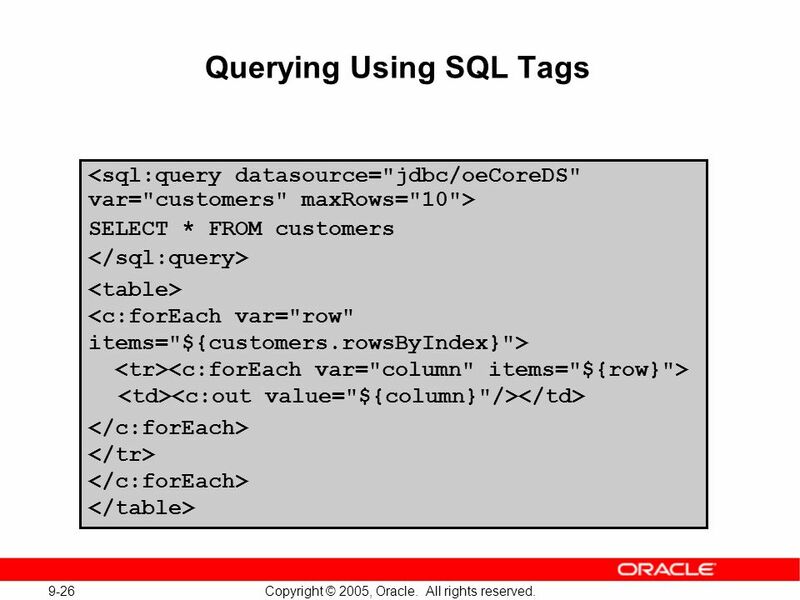 4 Copyright © 2005, Oracle. All rights reserved. 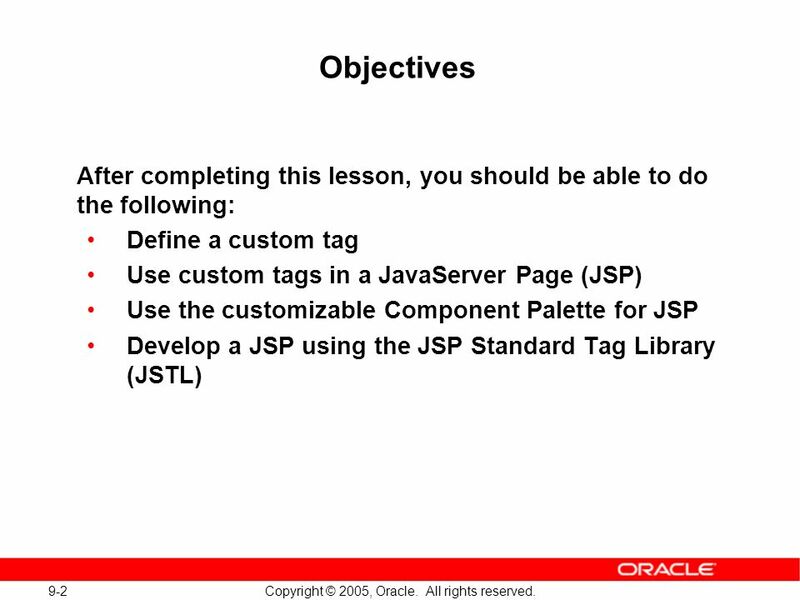 Creating the Web Tier: Servlets. 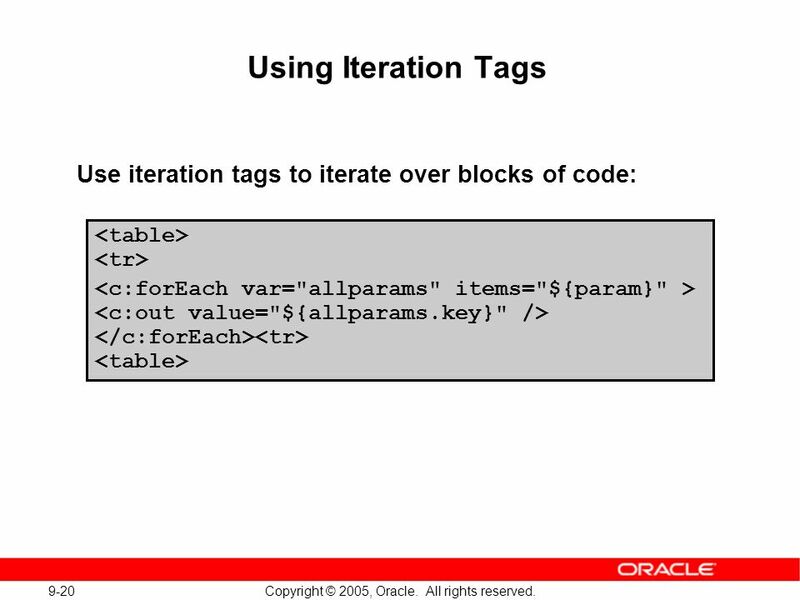 16 Copyright © 2005, Oracle. All rights reserved. Developing Message-Driven Beans. 11 Copyright © 2005, Oracle. All rights reserved. 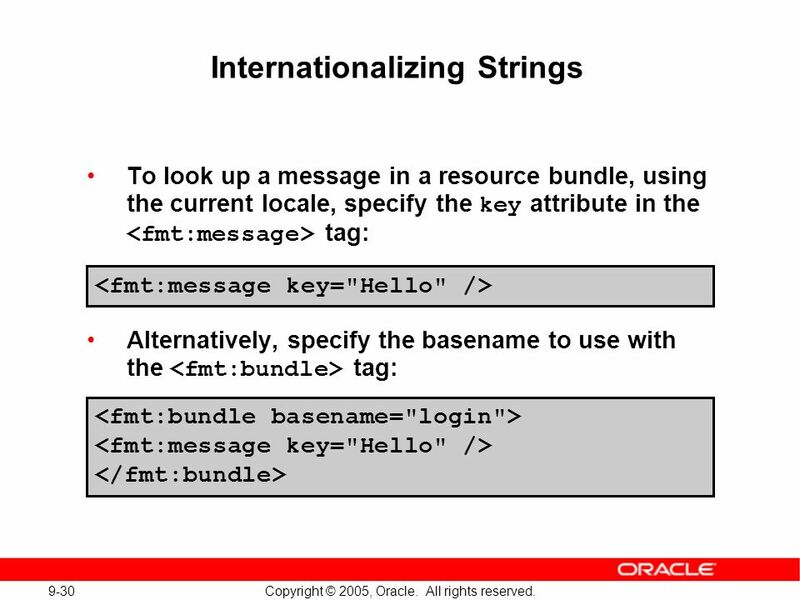 Creating the Business Tier: Enterprise JavaBeans. 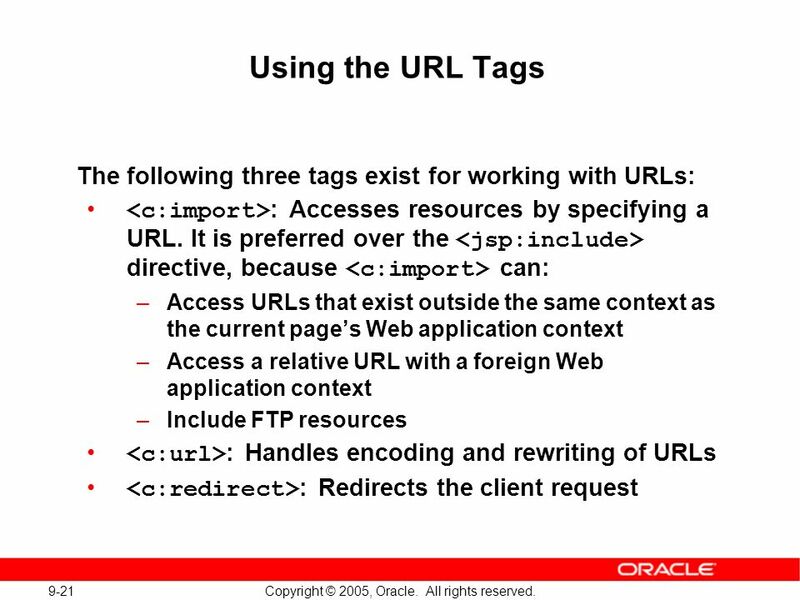 3 Copyright © 2005, Oracle. All rights reserved. 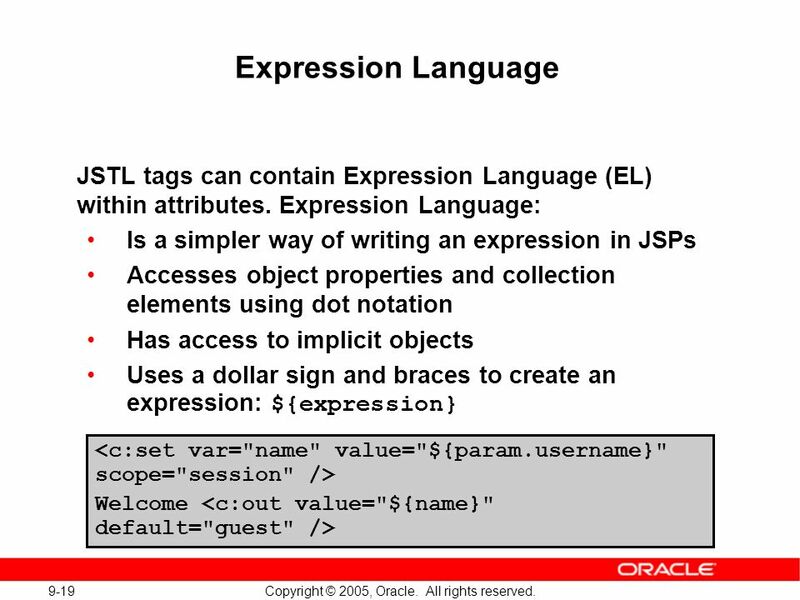 Basic Java Syntax and Coding Conventions. © 2012 National Heart Foundation of Australia. Slide 2.